The Miniature Schnaupin is a hybrid dog crossed between the Miniature Schnauzer and the Min Pin. The Minnie Jack is a hybrid dog crossed between the Jack Russell Terrier and the Min Pin. The Cockapin is a hybrid dog crossed between the Cocker Spaniel and the Min Pin. The Chipin is a hybrid dog crossed between the Chihuahua and the Min Pin. 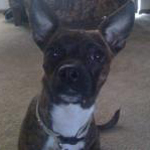 The Bospin is a hybrid dog crossed between the Boston Terrier and the Min Pin.